I don't think Minor League rebranding can get more ridiculous than this. On Monday, the Rookie League affiliate of the Milwaukee Brewers that has relocated from Helena, Montana to Colorado Springs, essentially as the spiritual successor to the Colorado Springs Sky Sox (who have moved to San Antonio as the latest incarnation of the San Antonio Missions, with the former Missions relocating to Amarillo and becoming the…Sod Poodles), announced their name, branding, and logos. The organization went off the grid, and didn’t choose any of the five finalists (which were, uh, Happy Campers, Lamb Chops, Punchy Pikas, Throttle Jockeys and Rocky Mountain Oysters). Instead, the team has been christened….the Rocky Mountain Vibes. Their logo? Naturally, for whatever reason, it’s a s’more. Other alternate logos include a flaming marshmallow on a stick with the Colorado “C” in the middle of it, and a flaming marshmallow on a stick with a bite taken out of it, forming a “CS” for Colorado Springs. I won’t lie – I’m probably going to get a piece of merchandise because this is simply too absurd to let pass by. But really, what the hell are we doing here? 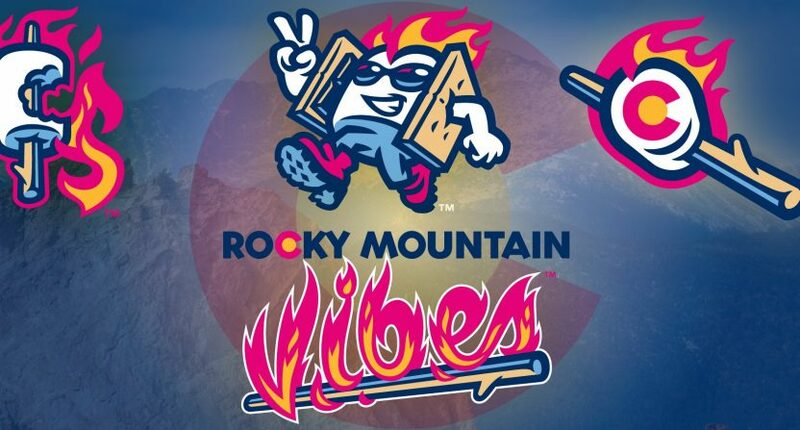 I am all about Minor League Baseball being fun, ridiculous, silly, and over the top, and the Rocky Mountain Vibes are clearly in that fun, ridiculous, silly, over the top spot…but I think this is the tipping point. You can’t get much more absurd than a s’more (with legs and, thankfully, pants) as a mascot, and with a word that is more of a feeling or a state of mind than an actual thing as a team name. Here’s hoping that Minor League ownership groups don’t try and somehow one-up the Vibes, and we start moving back towards traditional names. In other words, I really don’t want to see the Potomac Nationals end up becoming something completely ridiculous like the Virginia Partisans, or the San Jose Giants become (god forbid) the California Dreams.